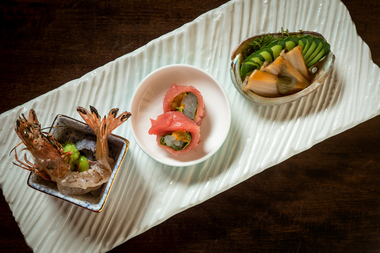 Sushi Seki is opening its doors at 365 West 46th Street next week. HELLS KITCHEN — A sprawling sushi restaurant with two bars, communal dining tables and three traditional Japanese tatami rooms where diners sit on the floor is opening in the Theater District next week. Sushi Seki that has locations in Chelsea and the Upper East Side, will open its third location at 365 West 46th Street on Monday, its owner said. The menu features sushi and sashmi, udon noodle dishes, panko-battered seafood and chicken and a surprise tasting menu of Chef Seki Shi's design. Shi grew up in China and later studied Japanese cuisine in Tokyo. He opened his first New York City restaurant in 2002 in the Upper East side and expanded to Chelsea last year.